Venice, Galignani, 1596. Map of Western Sarmatia, now Russia, Poland and Ukraine, etc., based on the geography of Ptolemy of Alexandria, c.100 AD..
Amsterdam, 1676. 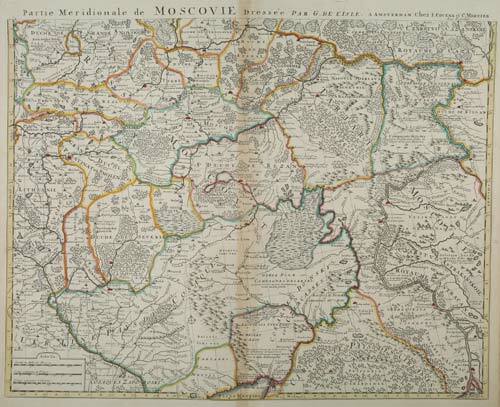 A 17th century map of Russia, published in a pocket atlas. Bungay: Charles Brightly, 1813. A view of the Kremlin, engraved by Phillips after Shepperson. Much of Moscow burned during the French occupation of Moscow in 1812, although the Kremlin, the heart of the city, miraculously survived. 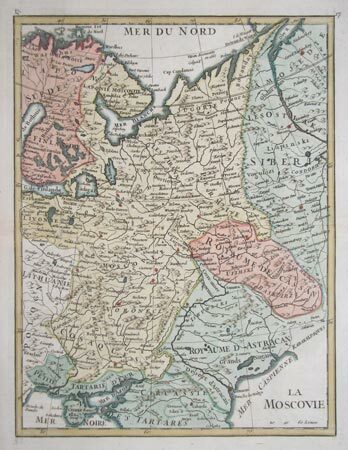 Ptolemaic map of Southern Russia. Venice, Valgrisi, c.1561. Published in Ruscelli's edition of Ptolemy's Geography, this map shows Scythia, the land of the Sarmatians, a classical tribe. The Crimea and Sea of Azov are lower left, the edge of the Caspian Sea lower right, from which the Volga river runs north. The first state, with the platemark extending off the top of the sheet. Basle, c.1575, Italian text edition. Russia, marking Moscow and Kiev in Ukraine, published in Munster's 'Cosmography'. Amsterdam, Jodocus Hondius, 1616. Hondius engraved new plates for his edition of the Bertius atlas 'Tabularum Geographicarum Contractarum', which he sold alongside the Mercator 'Atlas Minor'. Paris, c.1692. 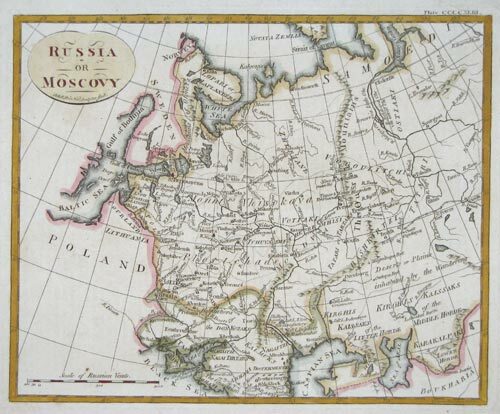 Russia, engraved by A. de Winter for the quarto edition of Sanson's atlas. London, c.1700. 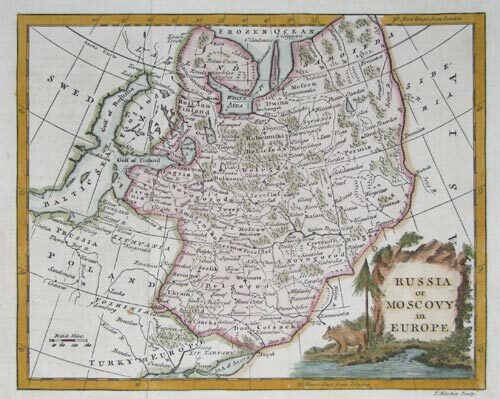 Russia from Morden's uncommon world atlas 'Geography Rectified...'. Map of Southern Russia & Ukraine. Amsterdam, c.1730. Marking Moscow, Smolensk & Kiev. Map from 'the first widely published atlas of the Russian empire'. St Petersburg: Acad. Imp. Scientiarum, 1747. Plate 8 from the 'Atlas Russicus', compiled by the Frenchman De L'Isle. Marked on the map are Jarensk and Totma, towns on the trade routes into Siberia. The title cartouche features a water-driven mine pump. Paris, 1750. A large and detailed pair of maps, based on the recently-published 'Atlas Russicus' compiled by Joseph Nicholas De L'Isle. Paris, c.1756. Russia in Europe. London, 1778. Russia, Siberia and Tartary, also showing the mythical island of 'Jeso' above Japan. Paris, c.1780. 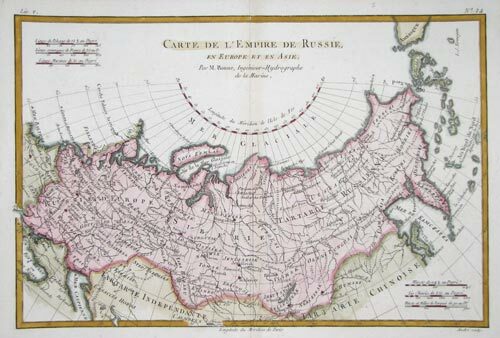 Russia, with Siberia and Tartary, engraved by André. Of interest is the unusual depiction of Alaska as an island between Asia and America. London, c.1780. Russia east of the Don. London, 1782. A map of Russia divided into provinces, including the Ukraine. Venice, 1782. Map of Muscovy, from Moscow east to the Volga River. 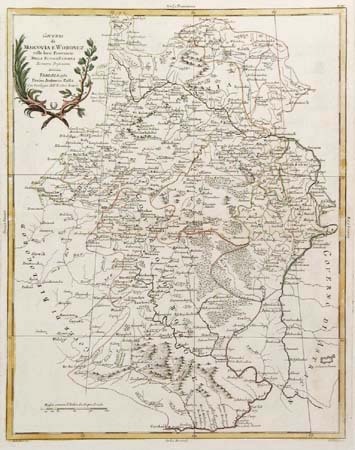 London: J. Sewell, 1785. A view of the busy quays of the Russian port. Vienna, c.1790. Map of the environs of St Petersburg, with the Baltic States and Russian control, including Estonia. London, c.1800. Engraved by Bell.